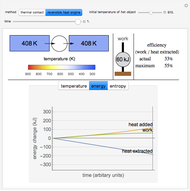 This Demonstration compares two ways objects at different temperatures can thermally equilibrate: irreversibly through thermal contact and reversibly with an ideal heat engine, utilizing a Carnot cycle. The heat engine converts some of the heat into work and results in a lower final temperature for the two objects than thermal contact. The schematics at the top show the changing temperatures of the two objects, the amount of work performed, and the efficiency of the process. The plots at the bottom show how temperature, energy, and entropy of the objects change. 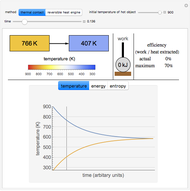 Most of the entropy increase (for thermal contact) or work generation (for the heat engine) occurs near the start of the process, when the temperature difference between the objects is maximum. In this Demonstration, both objects have heat capacity , close to that of 1 kg of aluminum at room temperature. The cold object always starts at the freezing point of water, , while the initial temperature of the hot object ranges up to 900 K, close to the melting point of aluminum. The Demonstration assumes that: (1) the heat capacity of each object is independent of temperature; (2) the objects have constant volume (i.e. do not expand with temperature); and (3) each object has a uniform temperature. For thermal contact, the final equilibrium temperature is , that is, the mean of the two initial temperatures. During this process, transferring a small amount of heat from the hot object, at temperature , to the cold object, at temperature , changes their temperatures by and , respectively. Their entropies change by and , respectively, and the total entropy increases because . 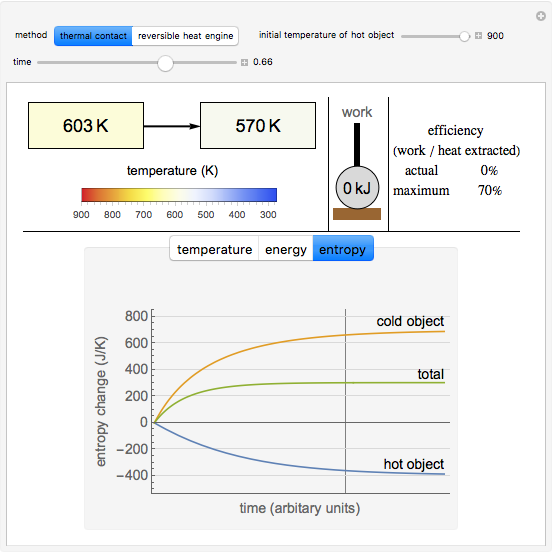 Using a reversible heat engine, a small amount of heat extracted from the hot object both produces a small amount of work and adds heat to the cold object. Energy conservation gives , and a reversible heat engine has . These relations determine the final temperature and work produced . The entropy of the cold object increases just as much as the entropy of the hot object decreases, giving no net entropy change for this reversible process. 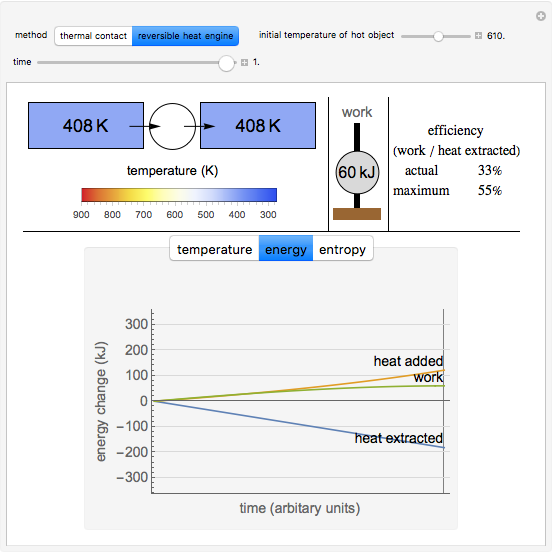 Efficiency is the ratio of work performed to heat extracted from the hot object. 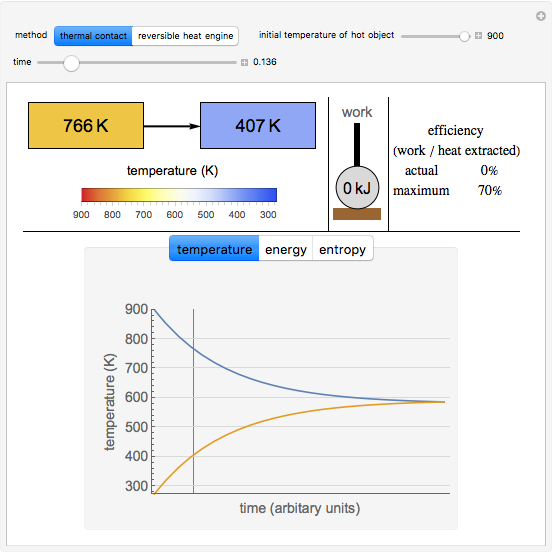 The maximum value shown in the Demonstration is the efficiency of a heat engine operating between heat reservoirs with temperatures and , by Carnot's theorem. Heat reservoirs are ideal objects with infinite heat capacity, so their temperatures remain unchanged when adding or removing heat. When using a heat engine, the actual efficiency at a given time is the ratio of work to heat extracted up to that time in the process. 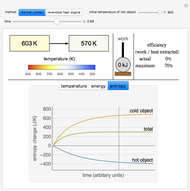 Efficiency decreases as the objects' temperatures approach equilibrium. Thermal contact, on the other hand, produces no work, so its actual efficiency is zero. With thermal contact, the rate of heat exchange is proportional to temperature difference, giving an exponential decrease in the temperature difference with time. Furthermore, reversible heat engines operate arbitrarily slowly. Thus for both methods, the time to reach equilibrium is indefinitely long. The time range used in the Demonstration is an arbitrary finite interval, schematically representing the indefinitely long time required to reach equilibrium. Since most of the change occurs when the temperature difference is largest, in practice, the objects reach thermal equilibrium in a finite amount of time. Based on exercises in . D. Lemons, Mere Thermodynamics, Baltimore: Johns Hopkins University Press, 2009. Tad Hogg "Irreversible and Reversible Temperature Equilibration"